While at first perhaps a bit intimidating… illustrating the life-cycle management within a BIM context is relatively straightforward. The purpose of this Framework is to provide a general guide that your team can quickly customize to your specific requirements. Like a restaurant menu or a travel guide, you can visualize the resources available and decide on an appropriate strategic configuration of options. Just begin in the Center and work thru this Action Agenda using, when available and appropriate, tested processes and templates. Using these guidelines, set up a BIM Management structure with your stakeholders. More specifically, modular, Model View Definitions (MVD), associated exchange specifications and common data architectures [for example: Industry Foundation Class (IFC), OMNICLASS] can help to integrate multi-discipline Architecture, Engineering, Construction (AEC) “activities”, “business processes”, “associated competencies” and “supporting technologies” to meet overall requirements with a goal of continuous improvement. Model View Definitions (MVD) and associated exchange specifications, provide the best benefit if they are modular and reusable and developed from Industry Foundation Class (IFC) Product Modeling Concepts. Model views and overall life-cycle management are similar in this regard. 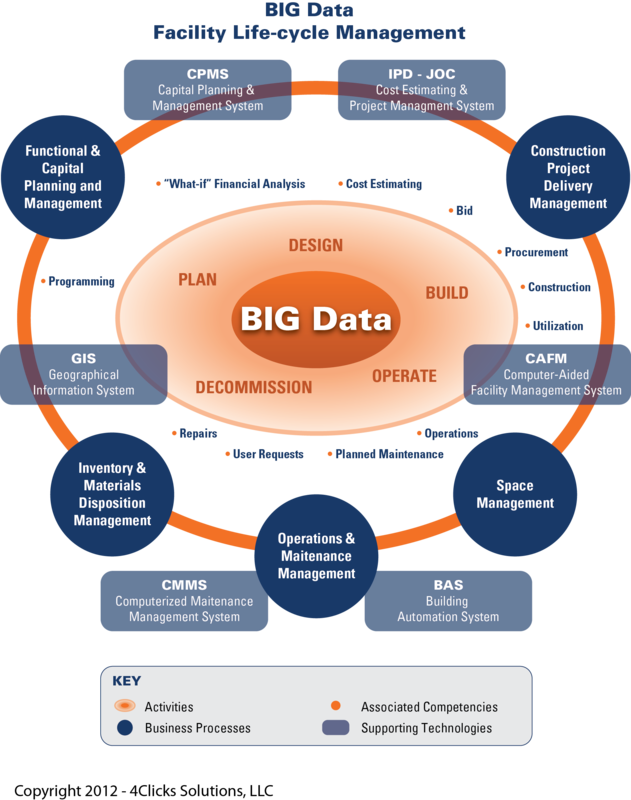 Building Information Modeling (BIM) tools serving the Architecture, Engineering, Construction (AEC) span multiple “activities”, “business processes”, “associated competencies” and “supporting technologies”, and each may required different internal data model representation to suit each domain. Data exchange is therefore a critical aspect. Inter and intra domain standardized data architectures and associated adoption of matching robust processes are really the first step toward successfully managing the built environment. Open BIM – What’s it going to take to get there? 1. Robust, collaborative construction delivery methods – IPD, Integrated Project Delivery, JOC – Job Order Contracting, et al . Collaboration in the building industry requires the integration of complex inter-related workflows whereby multitude of stakeholders are incorporated into a common pool of information, decision-support, and activities over an extensive period of time. 2. Standardized “Glossary”.. terms, acronyms, definitions. 4. Life-cycle perspective and management techniques/processes… vs. a “first cost mentality”. 5. Technology focused upon enabling robust processes…vs. current focus upon 3D modeling. Embedding vetted processes with technology enables consistent, scalable deployment. 6. Current examples of “open’ and standardized knowledge domains, processes, terms, and technologies. Capital planning and management systems (CPMS) – physical and functional condition monitoring and associated capital reinvestment planning. traditionally dealing with expenditures in excess of $10,000. Computerized Maintenance Management systems (CMMS) – inventory, repair, maintenance of ‘movable equipment’. Typically involving expenditures of $10,000 or less. 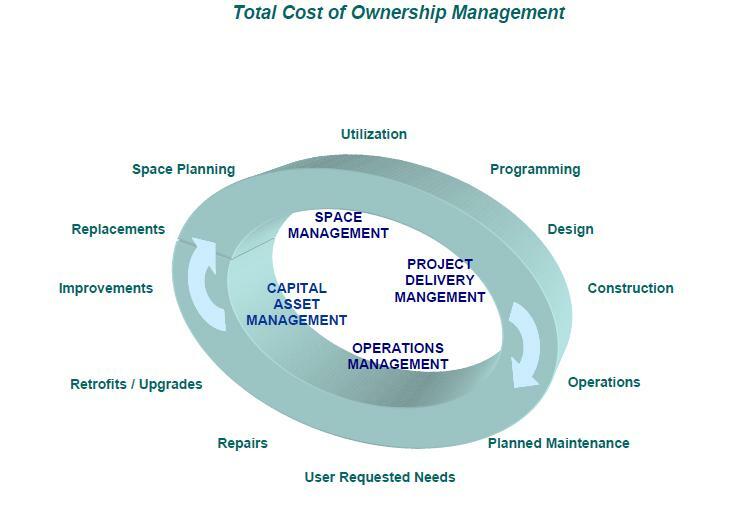 Computer-Aid Facility Managements Systems (CAFM) – space planning, move management, space utilization. Building Automation Systems (BAS) – security, life/safety, access control, environment systems management. Geographic Information Systems (GIS) – computerized location management / positioning. Simple Object Access Protocol, is a protocol specification for exchanging structured information in the implementation of Web Services in computer networks. Construction Operations Building Information Exchange (COBie) a specification used in the handover of Facility Management information. OMNICLASS in simple terms, a standard for organizing all construction information. The concept for OmniClass is derived from internationally-accepted standards that have been developed by the International Organization for Standardization (ISO) and the International Construction Information Society (ICIS) subcommittees and workgroups from the early-1990s to the present. ISO Technical Committee 59, Subcommittee 13, Working Group 2 (TC59/SC13/WG2) drafted a standard for a classification framework (ISO 12006-2, more information below) based on traditional classification but also recognized an alternative “object oriented” approach, which had to be explored further. UniFormat is a standard for classifying building specifications, cost estimating, and cost analysis in the U.S. and Canada. MasterFormat is a standard for organizing specifications and other written information for commercial and institutional building projects in the U.S. and Canada. BIM adoption remains a challenge due to the fact that its many supporters don’t focus upon it’s true relevance, the efficient life-cycle management of the built environment. While any new technology has barriers to adoption, changing the “status quo”, the fundamental nature of how a business sector does business requires a major event. The cultural and process changes associated with BIM, namely the need for all stakeholders to collaborate, share information in a transparent manner, and share in risk/reward, remain chasms to be crossed by many/most. Fortunately, those currently or previously involved with Integrated Project Delivery and Job Order Contracting (the latter a form of IPD specifically targeting renovation, repair, sustainability, and minor new construction) have experience with these “novel” business concepts. Both IPD and JOC have proven track records and have clearly demonstrated the ability to get more work done on-time and on-budget to the benefit of all involved parties. A key aspect of BIM, collaboration, can only be efficiently accomplished with a commonly understood and shared taxonomy including terms, definitions, and associated metrics. So called “open BIM”, such as buildingSMART International’s Industry Foundation Classes (IFCs), are important to enabling collaboration as well as interoperability between BIM software applications. COBie, a naming convention for facility spaces/components, etc., and its counterparts OMINCLASS, including MASTERFORMAT and UNIFORMAT, etc. … can be leveraged and generated by IFC appears a goal worth additional focus on a local and global level. That said, support for COBie, OMNICLASS, IFC, etc. varies and, far from mainstream. There are multiple knowledge domains, technologies, and process involve in the life-cycle management of the built environment, all of which need a common data architecture, taxonomy, set of metrics, etc. The need for an improved audit trail to allow greater confidence in collaboration. “Enforcement” of IFC by buildSmartalliance and all BIM “proponents” is required. Domain experts must leveraged and queried to deliver structured data templates accordingly. The industry needs well defined model view definition for each COBie data drop. From this can come clear guidance on the “level of detail” required at each COBie data drop. This will give a shared understanding of what information is required from and by whom and at what stage. For example needs of Facilities Managers are required to inform the content of the COBie data drops. Facility management must be considered as early as the briefing process. Weaknesses in the IFC import /export processes exist in current software product implementation. These weaknesses make manual checking necessary and reduce confidence. Improvement is vital here. While IFC can be used when generating COBie data, people will use whatever works and is available. The market requires. complete flexibility to choose what systems they use. Innovation should not be stifled by mandating a process to achieve the required data. COBIE is far from complete, but a good starting point. Microsoft Excel provides a view of the structured info of COBie data and one way 0f reporting data, however, in NOT a good authoring tool, nor does it support hierarchal relational data schema. BIM education and practice requires focus upon process and associated return-on-investment. Robust communication and adoption of standard and/or “best practice” construction planning and delivery methods specific to efficient life-cycle management of the built environment are sorely needed. It is amazing that Integrated Project Delivery – IPD, and “IPD-lite”… the latter being Job Order Contracting and SABER which are forms of IPD specifically for renovation, repair, sustainability and minor new construction… are not being brought to the forefront as critical aspects of BIM. It is the construction planning and project delivery method that sets the tone of any project and ultimately dictate relationships and associated successes or failures. Collaboration, transparency, and performance-based win-win relationships are necessary components of a BIM-based philosophy. Yet, these and other critical aspects; including defensible, accurate, and transparent cost estimating and standardized construction cost data architectures, are neither in forefront of current thinking nor receiving an adequate allocation of resources. Far too much emphasis continues to be place on the 3d visualization component aspect of BIM, IFC format pros and cons, and other “technology” areas. Technology is NOT what is holding back BIM, it is the apparent lack of understanding of … and associated failure to adopt … facility life-cycle management processes… combined and what can only be described as a pervasive “not invented here” attitude. Many of of our peers are reinventing the wheel over and over again at tremendous cost to all stakeholders…Owners, AEs, Contractors, Subs, Oversight Groups, Building Users, Building Product Manufacturers, …not to mention our Economy and our Environment, vs. sharing information and working toward common goals. BIM is not about software or technology but about CULTURE CHANGE and CHANGE MANAGEMENT. BIM is about simplifying and adding visibility to the life-cycle management of the built environment. You are either “on-board” or “not”. It’s up to you. 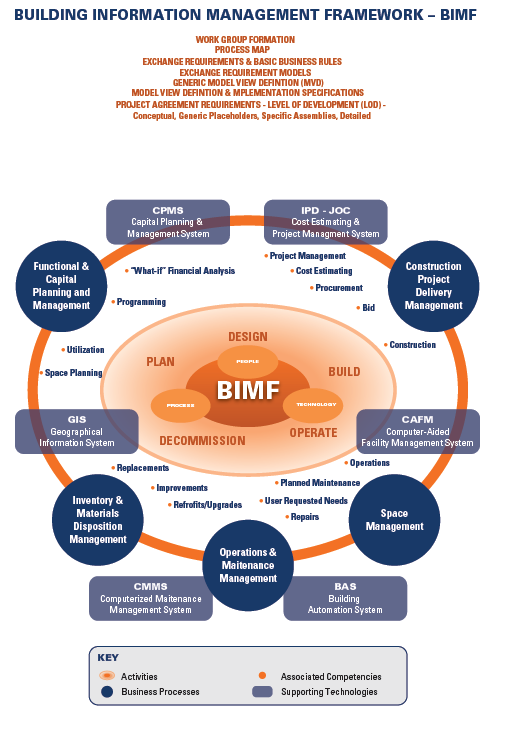 BIM and FM are synonymous. Unfortunately there are very few instances of BIM. The biggest mistake made by most people new to BIM is to assume that BIM is all about technology, and so focus all their efforts on mastering the technology rather than considering the impact that the application of this technology will have on the processes among Owners, AEs, Contractors, Subs, Business Product and Service Providers. via http://www.4Clicks.com – Premier software and services for construction cost estimating and efficient project delivery – IPD, JOC, SABER, IDIQ, SATOC, MATOC, MACC, POCA, BOA…featuring the best representation of RSMeans Cost Data, exclusively enhanced 400,000 line item database. This release candidate is the last preview before publishing IFC4 finally by end of this year. The work is led by the Model Support Group of buildingSMART International http://buildingsmart-tech.org/about-us/msg. improvement using the IFC4 Review Issue database at http://buildingsmart-tech.org/jira/browse/IFR. The review period is scheduled to end on 31. October 2012. Thereafter IFC4 final will be completed. via http://www.4Clicks.com – Premier cost estimating and efficient project delivery software for Job Order Contracting – JOC, IDIQ, SABER, SATOC, MATOC, MACC, POCA, BOA, featuring: Visual Estimating / QTO, enhanced 400,000 line item RS Means cost database with modifiers and full descriptions, contract / project / estimate / and document management, collaborative multi-user interface. The Industry Foundation Classes (IFC) create a neutral environment for interoperability by providing a comprehensive specification of the information throughout the AEC/FM project lifecycle, globally, across disciplines and software applications. However, the IFC schema does not capture the ways in which information is created and shared by practitioners; and the lack of specific definition of users’ exchange requirements has made it difficult to implement IFC compliant software solutions. The Information Delivery Manual (IDM) responds to these problems by proposing a methodology that captures business processes in AEC/FM projects and developing specifications of detailed user information exchange requirements. A progressive methodology to develop IDMs is presented in this paper. In this method Exchange Models (EMs) are utilized to provide the content of information exchange between users and/or software applications. Exchange Objects (EOs) are introduced as the fundamental elements in an exchange model, which contain the description of information units in non-technical terms that need to be exchanged in an exchange model. EOs are then developed further to provide the detailed technical attributes of the information categories in exchange models. EOs may be used in several exchange requirement definitions. Therefore, they are defined to be reusable within many exchange models. The level of detail and precision, and the representation type of EOs may vary in exchange models in different stages of the project lifecycle and are determined based on the business rules and with participation of industry experts. The details of the information capture to develop the IDM such that the IFC schema can be applied in national, local, or even project contexts are further illustrated. The paper finally presents the application of the introduced approach, using examples of architectural and structural precast concrete as a test base. requires common understanding of industry processes and the information required for and resulting from executing these processes (Wix, Nisbet, and Liebich 2009). However, the IFC schema does not capture the ways in which information is created and shared by practitioners. Implementation of IFC compliant software solutions is hampered by the lack of specific exchange requirement definitions by users. This paper is inspired by the PCI NBIMS project that aims at implementing IFC based interoperability solution for architectural and structural precast concrete. The project team’s role was to technically facilitate the precast concrete information exchange standard development. Based on this project a National BIM Standard, for precast concrete design, engineering, fabrication, and erection, was developed (Eastman et al. 2010a). IFC based information sharing tools need to be capable of securely and reliably exchanging accurate and appropriate data for specific purposes. To achieve this goal the first step is to capture the deployment information of exchange requirements. Then, one must develop an IFC based technical solution to satisfactorily meet those requirements and finally, it is necessary to deploy the technical solution (Hietanen 2006). Usually each IFC implementation and development project focuses on a small subset of the IFC schema based on the user oriented “use cases”. Usually use case definitions are the first step of model specifications and are developed on the basis of business processes and related Exchange Requirements (ER) based on the value chain of the end user (Weise, Liebech, and Wix 2009). This process is accomplished through a progressive method to develop Information Delivery Manual (IDM), presented in this paper. In this method, Exchange Models (EMs) are utilized to provide the content of information exchanges between users and/or software applications. Then Exchange Objects (EOs) are introduced as the fundamental reusable elements in an exchange model, which contain the descriptions of information units that need to be exchanged in non-technical terms in an exchange model. In this paper, we focus on the user requirements stage, as defined in the IDM. In the next step and through IFC Model View Definitions (MVDs), subsets of the IFC Model Specification required for IFC implementation of exchange models in software applications are defined. Therefore, MVD development efforts aim to providing an unambiguous guidance for implementation of IFC as a technical solution for interoperability needs in specific use cases. To facilitate interoperability in the AEC/FM industry, product data standards like IFC and CIS/2 have been developed. The IFC model specification is the most comprehensive data model with an object oriented data-schema that provides support for collecting data from a project model in a neutral computer language and representing shared information in a wide range of AEC/FM industry processes (Froese et al. 1999). The data sets’ definitions and rules embedded in the IFC data model provide the basis for developing IFC interfaces for software platforms, which enable sharing data between software applications with different internal data structures (NIBS 2008). IFC implementations enable users to access the highly structured and attributed object model data used in Building Information Modeling using an application programming interface (API) according to their predefined rights. However, the IFC schema does not define the information exchange requirements specific to different project stages and between different project actors and software applications, which makes it difficult to develop useful IFC software interfaces. Accordingly, software developers and users demand IFC implementation guidelines that allow focusing on use cases of interest and guarantee compatibility with other software implementations. Development of the IDMs and MVDs has been a significant initiative to solve this problem by identifying the subset of IFC data model needed to support the user defined business processes (Wix, Nisbet, and Liebich 2009). projects and their current IFC capabilities (Bazjanac 2002). IFC development efforts incorporate requirements defined by industry experts. The IDM framework that we have incorporated in this project is different in some aspects from some European efforts. The IDM guide developed by buildingSMART, Norway (BuildingSMART 2006) and some other European IFC deployment guides have expanded the scope of IDM to all the IFC deployment activities from defining process maps to developing IFC concept bindings. So the boundary between IDM and MVD development is blurred. On the other hand, some IFC deployment guides (Hietanen 2006) have considered the distinction between these two. The second approach views IDM as a method to identify the user exchange requirements during different processes with specific purposes. And the task of mapping these information exchange requirements with particular IFC releases is passed to MVD development stage. This approach clarifies the interface between IDM and MVD and makes it simpler to apply the whole IDM/MVD methodology. It provides a more effective way to communicate the exchange requirements to industry experts at the IDM level and to software developers at the MVD level. Considering all these advantages, we have applied the latter methodology in the current project, distinguishing the scope, purpose, and outcome of IDM and MVD development processes. Thereby, IDM is applied exclusively as an information exchange requirement definition process and MVD as an IFC based technical solutions development process. Therefore, the final outcome of an IDM is a set of IFC independent information items defined for different Exchange Models (EM). Each of these information items, which are called Exchange Objects (EOs), can then be reused in several EMs and their functionality in each EM is illustrated by specified business rules and level of detail. Facilitating the integration and collaboration between different disciplines involved in an AEC/FM project is one of the major focuses of BIM. In fact there is a close interaction between the BIM value proposition in projects and degree of workflow integration and continuity of information flow through project lifecycle. Hence, BIM aims to eliminate the non-value adding or lower value adding activities, to integrate the high value adding but fragmented tasks and to improve the automation of processes and the project performance in terms of project time and cost. To achieve these goals the first step is to determine the information value chain throughout projects and identify the inefficiencies of current practices. This will enable an enterprise systems analysis and devising alternative processes that streamline the information exchanges and enhance the information value gained by different project activities. The processes, actors, and information flow that are aimed to be supported by BIM tools are defined by Process Maps (PM) (Weise, Liebech, and Wix 2009). The Business Process Modeling Notation (BPMN) is a standard for expressing process maps which are flow-oriented representations of business operations (Ouyang et al. 2009). In BPMN, developed by Object Management Group (OMG), the useful ideas of previous process modeling notations like IDEF0 (ISO10303) and the activity diagrams component of the Unified Modeling Notation (UML) have been incorporated (OMG 2005). BPMN models have been mainly used to facilitate information exchange and communication between project participants and to aid with decision-making based on various analysis techniques. However, detailed BPMN models are increasingly used as maps to identify the information packages exchanged in business processes and so to define required software features in systems development efforts (Ouyang et al. 2009). tasks may be broken down into sub-processes that may be executed multiple times concurrently (Weise, Liebech, and Wix 2009). In the PCI NBIMS project, that we are going to discuss in this paper, mapping processes using BPMN was the first step in developing an Information Delivery Manual (IDM). BPMN models were useful for identifying the Exchange Models (EMs) in precast concrete projects and provide a base to later identify the content of each information exchange package in the IDM. The main building blocks of process maps are called “use cases”. They define information exchanges between any two actors in a project aimed at achieving a specific goal, within a specified phase of a project’s lifecycle. Hence, use cases provide detailed description of the content of the information exchanges. Defining use cases is the first step of determining model specifications, and thereby needs special attention in IFC based software interface development efforts. A particular use case can depict a singular information exchange or a set of iterated exchanges that are illustrated by a loop sign as shown in Figure 1. Use cases are usually part of a greater network of information exchanges and collaborations throughout the project stages and between different project actors that provide the comprehensive process maps of a project (Eastman et al, 2010b). Developing and implementing standardized information exchanges across industry domains can support vigorous data sharing throughout the information value chains of the industry. While interoperability tools like IFC are international mechanisms to share data, the required data to be shared is different in various localities (NIBS 2008). Defining the content of the information exchanges for each use case, known as Exchange Requirements, is a process based on the involvement of industry experts. This way Exchange Requirements reflect the local processes and legal and contractual obligations. Therefore, it is important that internationally applicable solutions strongly support the specific local applications (Hietanen 2006). Moreover, business requirements should be defined in a way that demand improvements in the status quo and aim to optimize current information sharing thereby initiating further IFC developments (Weise, Liebech, and Wix 2009). Because of the diverse localities and need for customization of business processes, there is no single process map structure that can represent the entire AEC/FM industry spectrum. Usually there are various ways to compose use cases to achieve similar final purposes (Eastman et al, 2010b). However, some use cases may not be implemented in specific sub-domains of the industry or new use cases may be added for specific purposes. Therefore, in designing the IDM it is important to identify the best practices across the industry and focus efforts on developing interoperability tools that support (and possibly advance) these best practices. The result of the process modeling stage is the definition of a set of exchanges needed to support some business activity or domain, characterized by one or a set of use cases between two actors or roles and different stages in the project delivery lifecycle. The next step after identifying the use-cases is to define the information exchange content. As with developing the BPMN, the active involvement of industry experts is necessary in defining the sets of information required for each exchange. Over multiple iterations, working on two different domains, we have tentatively developed a template to capture the information needed to support the user specification of an information exchange. The exchange model content template and an example are provided in Figure 2 and 3. Project Stage What is the Omniclass design stage? Who are the parties to this exchange? By Omniclass discipline number and name? via www.4clicks.com – Premier cost estimating and project management software for JOC, IPD, SABER, SATOC, MATOC, MACC, IDIQ, POCA, BOA. IFC – BIM – IFD : Your thoughts? Is it the answer to building product libraries? An item instantiated in an IFC file gets a mandatory unique ID. This creates a problem creating a product library. Agree? IFD is being developed to address this issue and others. How exactly? The true value of BIM is Total Cost of Ownership / Life-cycle Management, NOT 3D visualization. Once we move toward this goal in an integrated manner, owners and the AEC industry will be able to transition toward a collaborative, efficient method of working together to address the significant sustainability and economic issues faced by all. 4D – 5D – BIM provides a business process and a supporting technology backbone to leverage the above and drive transformational AEC industry change. Education Facilities Officers/APPA, the Federal Facilities Council, the International Facility Management Association, Holder Construction Company and Infrastructure Strategies, my consulting company at the time. planning and construction, through operations and upgrades, to demolition/replacement. governing bodies of the participating organizations. used as a framework for organizing the glossary of commonly used terms and definitions. management, operations management, capital asset management – and competencies. Metrics and/or cost models that can be used to measure the level of performance of each industry and competency are identified. The definitions for each of the identified terms are derived from earlier work of the participating organizations and modified by the Definitions Committee. contribute to more effective facilities and infrastructure asset management across the entire industry. The above can be used in concert with COBIE / COBIE2 , IFC , as well as other important standards.